I think I’ve posted a few times before about TED, it’s 20 minute videos are fantastic, and the iPhone app in particular is a great way to pass time. I’m just catching up on my email and RSS feeds and spotted a post over on Steve Claytons blog about a Sliverlight based TED player from thirteen23. 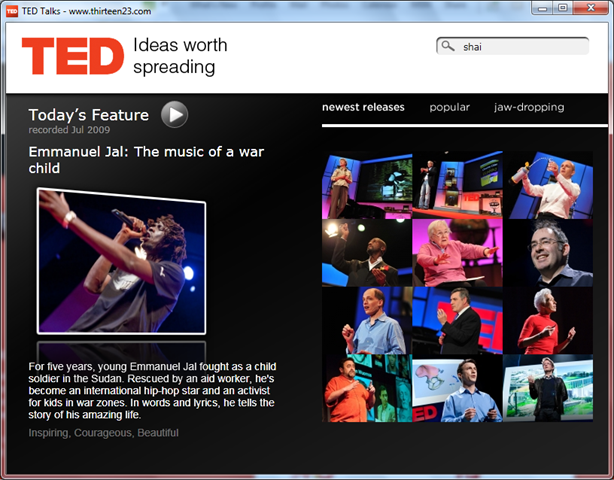 It’s a nice little app that does nothing but present TED talks to your desktop. Thirteen23 seem like a great little company, they’ve released a few WPF and Silverlight apps such as the Blu twitter client and each one looks amazing and works pretty well. I like the way that they build desktop apps for web based services in much the same way as people are doing for the iPhone. Whilst there are lots of Twitter clients out there, not many people are doing things for other services or sites like TED. It’s good to see.